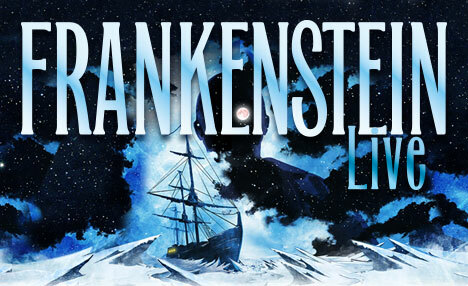 Frankenstein Live opened last weekend at the Walmer Centre Theatre in the Annex. The script was written by Warren MacDonald, and is a stage adaptation of Mary Shelley’s Frankenstein. There is no dialogue in the book, and so MacDonald notes in a recent interview that his biggest challenge was to imagine the dialogue realistically while remaining true to Shelley’s novel. The director, Tom Carson, was also explicit that he wanted the audience to listen to the language of Shelley’s story, and to engage not just with the plot and the 19th century sci-fi of the monster, but with the story’s core ideas. When I walked into the space, I was impressed. Considering how institutional the community centre is, the creative team managed to transform the space into an facsimile of the main deck of a ship – the ship on which Victor Frankenstein relays his horror story to a friendly (and lonely) sailor who takes pity on him and takes him aboard. The main stage was wooden, with shorter podiums for the actors to stand at, and taller poles from which ropes were hung diagonally across the stage. The resulting effect meant it felt very much like we, the audience, were watching from the deck. A background score augmented the more emotional moments while at other times set an ominous background tone. It was a nice idea and was effective, but not consistently. A few times the transitions were a bit delayed, forcing the actors to shout a bit to be heard. At other times, the music seemed a bit too much, and I wondered if the actors themselves could have communicated some of the raw fear and anxiety more if there hadn’t been music that made it so very very clear that what we were meant to be feeling is fear and anxiety. If the language is what Carson wanted to focus on, why couldn’t the language speak, as it were, for itself? Given that Carson wanted to focus on the language, I found that the actors were often stiff. It is a staged reading, which means the actors don’t have the text memorized, instead reading directly from a script. But even so, it seemed possibly under-rehearsed since most of the actors seemed to hit a lot of the same emotional notes over and over again. Admittedly Stephane Garneau-Monten, who played Victor, had a real challenge, since his character goes through a range of related emotions from guilt and isolation to fear, being out of control, and finally to disgust with the monster and himself. But it’s precisely because there is a huge range within a narrow scope that expressing this nuance matters, and I often felt like one note was being hit for long enough for me to start tuning out the text, making it difficult to really focus on the language. Janelle Hanna as Elizabeth was the strongest in this respect, hitting the notes of her narrative arc really clearly as she went from love for Victor, to worry, to deep frustration and finally fear. Carson’s choice to present the monster as a shadow behind a screen was both effective staging and metaphorically relevant. The monster is, after all, the shadow from which Victor cannot escape, a kind of reflection of Frankenstein himself. I only wished that the monster had spoken his lines behind the screen, since when the Warren Macaulay finally came out, his handsome face replaced the imagined face of the monster inside our heads, which is what had been so effective in the first place. Overall the production has a few things going for it – and in some ways this story is good enough to outweigh the production’s drawbacks – but this reading didn’t hit the level of sophistication I was hoping for.